Old-Fashioned Homemade Peanut Brittle is a crispy, crunchy homemade candy loaded with roasted peanuts in a buttery, sweet candy coating. It's the best peanut brittle EVER and perfect for homemade gift-giving. Line a baking sheet with parchment paper or a silpat mat, or butter it well. In a large, heavy bottomed pan, combine the sugar, corn syrup, water, and salt and bring to a boil over medium heat, stirring occasionally. Continue to cook, stirring frequently until the temperature reaches 280 degrees F on a candy thermometer. Add the butter and peanuts and continue to cook, stirring constantly another 7-10 minutes until the temperature reaches 300 degrees F.
When the candy reaches 300 degrees F, immediately remove from heat and add the baking soda and vanilla, stirring vigorously to combine. Immediately pour the hot brittle mixture onto the prepared baking sheet, then tilt and jiggle the sheet to help it spread covering the entire pan from corner to corner. 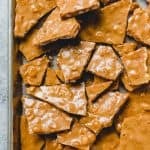 Let the peanut brittle set until completely hard, then use a mallet or back of a spoon to crack the brittle into chunks or bite-size pieces. Store in an airtight container for up to 1 week. If using salted peanuts, omit the salt in the recipe.